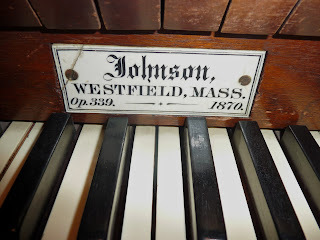 If you're much more sophisticated than me, you may be interested in musical history and - in particular - pipe organs. For the first time in 20 years, you can hear the Johnson Opus 339 organ, built in 1870 this Sunday, March 13th at 4pm at Stamford's Unitarian Universalist Society (20 Forest Street). - Julia Morris-Myers, organ (from the St. Saviour’s Episcopal Parish in Bar Harbor, Maine and the Acadia Choral Society). - Maureen Ferrara Higle, piano (from our own Unitarian Universalist Society). - Louise Schulman, viola (founding member and principal viola of the St. Luke's Chamber Ensemble (since 1974) and Orchestra of St. Luke's). - Darwin Shen, violin (Yale and Juilliard trained private teacher and chamber coach). You can learn more about the organ here and more about the concert here. Suggested donations for the event are $15.